Before you can charge VAT on your sales and track VAT on your expenses, you’ll need to set up all the VAT rates that your business uses. To add VAT as a sales tax, in the left-hand navigation menu click Settings > Sales Taxes and add each VAT rate that your business uses. For convenience, make sure the names of all your VAT sales taxes start with "VAT." This way, they will all be grouped together and easy to find when you are applying them to transactions or journal entries. Standard 20% Applies to most goods and services supplied to customers in the UK. Reduced 5% Applies to specific categories of goods, generally with some element of public welfare, e.g. children’s car seats; installing residential heating equipment for customers over the age of 60; domestic fuel; etc. A business is unlikely to be frequently purchasing items at Reduced Rate, and you will need to consult detailed VAT Guides if you believe your supplies should be at Reduced Rate. Zero Rated 0% Applies to most foods (but not prepared take-away food); certain essentials such as sewerage services (both residential and commercial); services supplied by or—in some cases to—charities; etc. Exempt 0% Applies to a variety of sporting, cultural, medical and essential services, for example physical education and sporting activities; admission charged by charities; burial and cremation; health services and medical care; certain Royal Mail services; most financial services. Non-Recoverable Purchases Effectively 0% Applies to purchases that contain VAT, but where your business is not allowed to recover the VAT. The example that most small business owners are familiar with is business entertaining, where your expenses do have VAT included in them, but you are not allowed to reclaim the input VAT. You can read more about the VAT rates that apply to different goods and services in the official HMRC Guidance. What’s the point of setting up 5 VAT codes when 3 of them charge 0%? 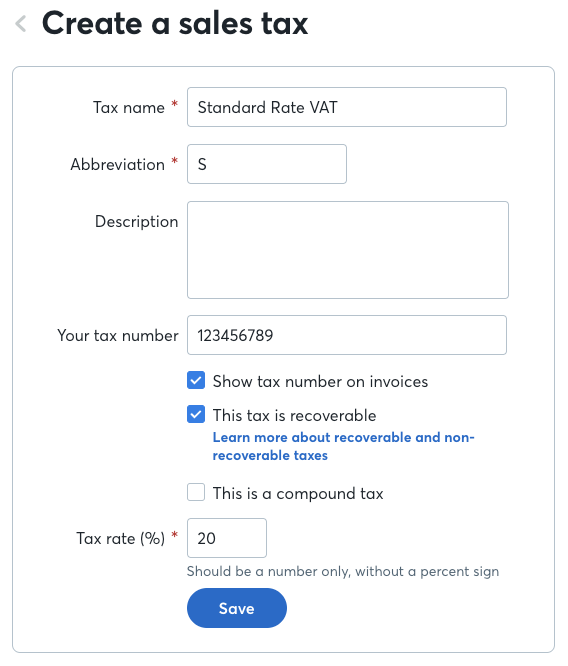 If you’re focused on calculating the VAT you need to remit to HMRC (or claim back from them), it can feel like there is very little purpose in recording all the 0% VAT codes. However, when you submit your VAT100 return, HMRC requires you to report information about your sales and purchases that will depend upon you having recorded this level of detail. Businesses that make Exempt supplies are also required to make adjustments to the Input VAT that they claim on purchases, either by precisely identifying the purchases that contributed to their Exempt supplies and not reclaiming VAT on those purchases, or by pro-rating their recovery of input VAT relative to the proportion of their supplies that were non-exempt, i.e. subject to VAT (whether Standard, Reduced or Zero rated). If your VAT registered business makes sales to businesses in other EU states without charging VAT, or purchases from other EU states without VAT applied, then you will need to be able to identify those transactions when preparing your VAT return. *Wave looks for these exact abbreviations when it builds your VAT100 report. If you have previously created Sales Taxes for EC Goods/Services you can continue to use them, but make sure you edit the abbreviations if necessary to match the values given here. If you don’t make sales or purchases to or from the EU, you can skip this and simply create the additional tax codes later, if needed.